European University Cyprus is an educational institution that is responsible for the formation and training of health professionals in Cyprus and internationally. The institute was established as Cyprus College in 1961 and was granted university status in 2007. Over the last decade, the university has fostered a culture of modernization that has resulted in levels of growth that have exceeded all expectations, upgrading the quality of tertiary education in Cyprus and defining a clear international orientation for the university and the country. Presently, European University Cyprus has five schools: the School of Humanities, Social and Education Sciences, the School of Business Administration, the School of Sciences, the School of Law and the School of Medicine. In addition, European University Cyprus operates a Distance Education Unit. All Bachelor’s, Master’s and PhD Programs have been approved by the Cyprus Agency of Quality Assurance and Accreditation in Higher Education and are recognized worldwide. The “Support for the health workforce planning and forecasting expert network” (SEPEN) joint tender is a new action in the field of European health workforce planning. The action supported by the Health programme of the European Union and is to establish an expert network on health workforce planning and forecasting. The purpose of this joint tender is to sustain cross-country cooperation and provide support to Member States to increase their knowledge, improve their tools and succeed in achieving a higher effectiveness in health workforce planning processes and policy. It builds on the results and work undertaken by the Joint Action on European Health Workforce Planning and Forecasting (EU JAHWF) and aims to further contribute to health workforce planning and forecasting agenda in Europe. EuroNet MRPH stands for European Network of Medical Residents in Public Health, and constitutes a network of European National associations of Public Health training programs, including medical and non-medical residents. It is a non-profit, international, independent and non-governmental association. EuroNet MRPH aims to create a professional network among European residents in Public Health in order to share information on educational programs, to facilitate exchange and common activities, as well as to develop a body of scientific research. Pursuing a medical career? Join MEDizzy 200,000+ medical community and discover 30000+ free resources that will boost your medical knowledge! MEDizzy is the fastest growing medical learning community! Clinical cases, photos, images and high quality videos are shared every day by healthcare professionals from all over the world. The Cyprus Refugee Council (CyRC) strives to safeguard, support and advocate for the rights of vulnerable groups in Cyprus, promoting their effective integration into the host society. Focusing on refugees, asylum seekers, detainees, trafficking victims and survivors of torture, CyRC works closely with the local society in order to provide quality services at the individual, community and policy level. 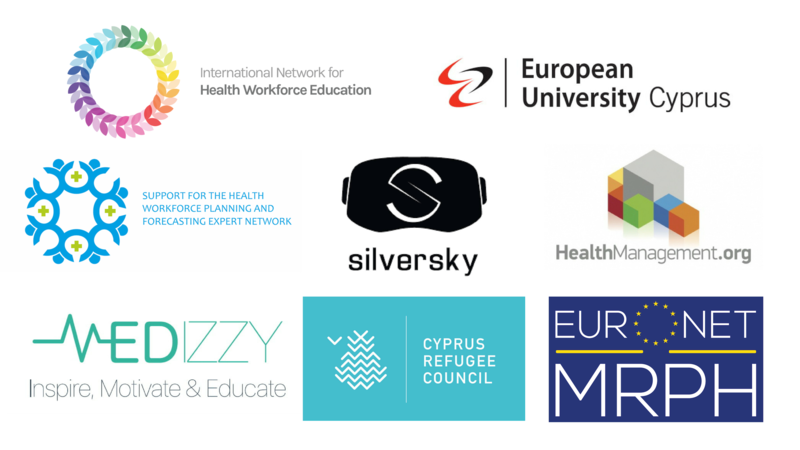 Silversky was formed following two successful research grants from the European Research Council (ERC) under the Proof of Concept call and subsequent funding from the Young Entrepreneurship program of the Ministry of Labor and Commerce of Cyprus. It was founded in 2014 by scientists from the Experimental Psychology Lab of the University of Cyprus to undertake commercial projects in the construction and interior design sectors. Since then, it has evolved into a Research and Development company that is active in a variety of fields. In general, the company adopts a multifaceted approach that includes services to clients, funded research collaborations with scientists, development of own products, and social responsibility projects.